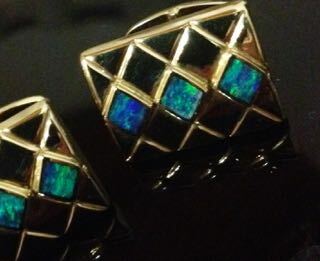 Handmade in the Queensland Tablelands in Australia, each Cuff link is composed of three precision Diamond Cut Lightning Ridge Solid Black Opals set up high into 14 ct solid gold luxurious rectangle. They flash blue and green - which is the signature "colours" of Lightning Ridge Opal that can been seen both in daylight AND in artificial light. 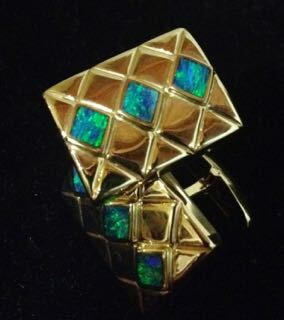 The colours of these gem opals against the yellow gold background look amazing and make the Opals really pop. They are made of 14 carat gold and the precision mechanism on the back, is top quality German made and also 14 carat gold and hallmarked. 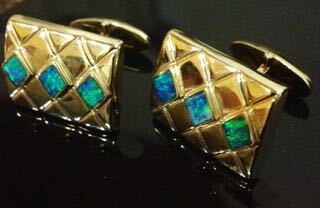 Hand made Cufflinks of this calibre are VERY rare; even in Australia the home of OPAL you will not find Cuff Links that are set with Lightning Ridge Black Opals. They measure 2 cm by 1.5 cm. Weight together is 120.06 grams. and they are entirely HANDMADE!